The company invented the first commercial first aid kit 130 years ago—and then proceeded to roll out innovative spinoffs designed to help treat everything from war wounds to snake bites. Summer is in full swing, which means it's officially the season of outdoor adventures, summer sports camps and neighborhood barbecues. It also means it's prime time to keep a first aid kit handy to take care of inevitable cuts and scrapes. 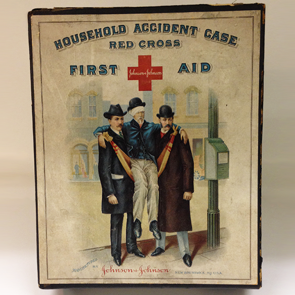 Did you know that Johnson & Johnson can be credited with creating the very first (and now ubiquitous) commercial first aid kit in 1888? Robert Wood Johnson, co-founder of Johnson & Johnson, was traveling on the Denver & Rio Grande railroad when he struck up a conversation with the railway company's chief surgeon and learned that railroad workers often sustained injuries that proved fatal because they lacked access to hospitals—or on-site emergency medical supplies. 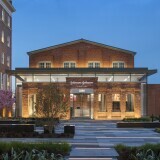 Moved to help, Johnson reached out to surgeons at other railroads to research what kind of supplies would be most useful—and then used this intel to create the first commercial first aid kits, packed with necessities like sutures, sterile wound dressings and surgical tape. 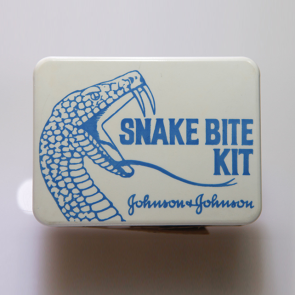 The kits became so popular that Johnson & Johnson began making versions tailored to other industries or situations. Whenever a new type of transportation was introduced—such as the automobile or airplane—or an activity like boating or hiking became increasingly popular, the company created a customized kit, says Margaret Gurowitz Margaret Gurowitz,Chief Historian, Johnson & Johnson, Chief Historian, Johnson & Johnson. 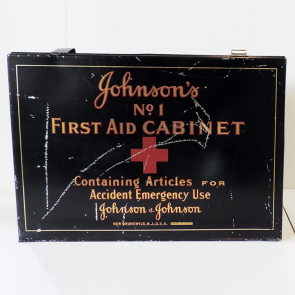 From Boy Scouts to owners of the first Ford Model T cars, Johnson & Johnson has helped just about everyone stay safe with first aid kits over the past 130 years. The U.S. Army reached out to Johnson & Johnson for assistance with medical supplies during the Spanish-American War. Even though the company was only 12 years old at the time, it mobilized to create a special first aid packet for soldiers on the battlefield. The packet—containing antiseptic compresses, bandages and safety pins—was small enough for a soldier to store in his uniform so a medic could use the supplies to help stanch bleeding, set broken bones and administer other lifesaving treatments on the spot. 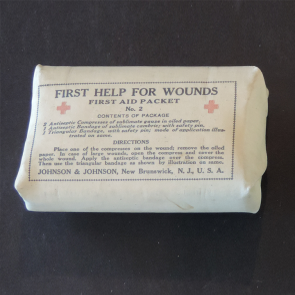 Railroad and factory workers weren't the only early customers who benefited from Johnson & Johnson's first aid kits. 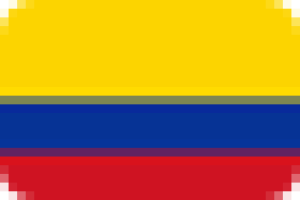 The Household Accident Case was a small kit intended for—you guessed it—household use. It was originally packaged in cardboard but was upgraded to a white metal case in the 1920s that was meant to be hung on, say, a bathroom wall for easy access. In addition to the standard antiseptic medical supplies, the kit contained a set of first aid instructions and space where the owner could jot down the phone numbers of local emergency service personnel. 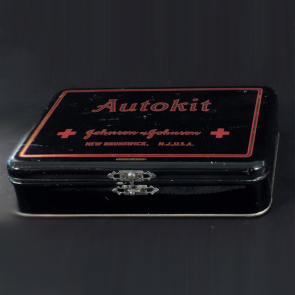 In recognition of the growing popularity of automobiles, Johnson & Johnson introduced the Autokit in 1906, two years before the Ford Model T hit the market. The case's contents—including burn ointment—were meant to help treat injuries at a time when cars were much less reliable than they are today. Fun fact: The Autokit hitched a ride in the race car that broke the land speed record in 1928. At the turn of the 20th century, more and more manufacturing facilities were popping up across the country, staffed with laborers who were operating dangerous machines. In response, the Johnson's Factory Case was created, containing all the products of a general first aid kit, says Gurowitz, but they were sold in mass quantities to meet factory demand. By the early 1920s, the Factory Case had been rebranded as the Johnson's No. 1 First Aid Cabinet (pictured), which was touted for use in many different types of workplaces. By the 1920s, people were on the move—whether journeying cross-country by train or around the region via car. 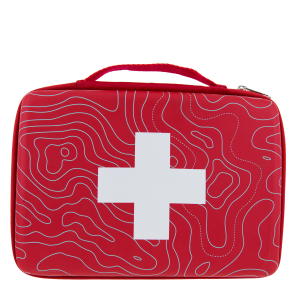 So Johnson & Johnson debuted its Travelkit, a pocket-sized first aid kit that contained items to treat minor injuries when traveling to areas where medical care was limited. 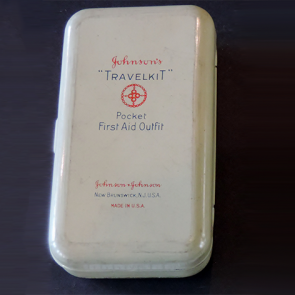 The Travelkit was special for another reason: It hit the market the same year as the company's BAND-AID® Brand adhesive bandages, so it was one of the first kits to include the iconic product. 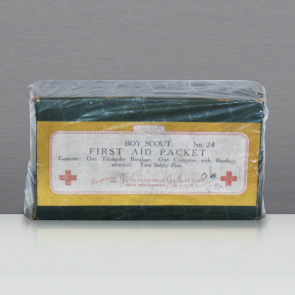 We know that Boy Scouts are all about being prepared, and in 1925, the Boy Scout First Aid Kit helped them do just that. 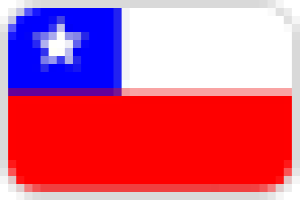 The green-and-yellow cardboard container—which included a set of first aid instructions, safety pins, a compress and a multifaceted triangular bandage—was created to teach scouts proper first aid techniques and help them earn their first aid merit badge. 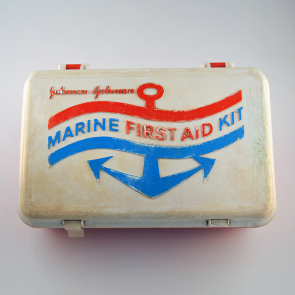 In 1932, Johnson & Johnson also formed a partnership with the Girl Scouts to make first aid kits for their use, too. 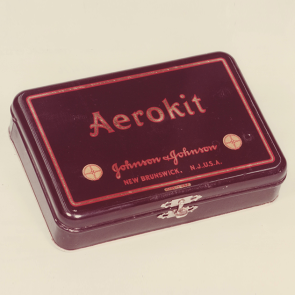 After the first historic transatlantic flight accelerated the aviation craze of the 1920s, Johnson & Johnson put the Aerokit on the market. The small first aid kit was designed for the aviation enthusiast to use on the small one- to two-passenger planes of the day, and included burn emollient, a miniature first aid chart with instructions on how to treat plane-specific injuries in the air and on the ground, and aromatic spirits of ammonia, which could be used to revive a passenger who lost consciousness in the air. 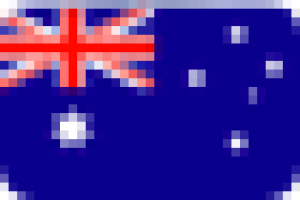 The Aerokit's metal case came in a heavy cloth bag, with a loop attachment, so it could be attached to the aviator’s belt or to the inside wall of the plane. 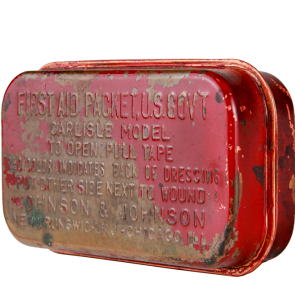 Shortly after World War I, the U.S. military decided to improve the quality of soldiers' first aid supplies and began packaging them in a wallet-sized, watertight metal container. The kits—which included wound dressings to help treat severe injuries caused by shrapnel and shells—were named after the Carlisle Barracks Army installation in Pennsylvania, where the kits were first created. This kit was created at a time when, thanks to a manufacturing boom that helped boost wages, more people had the time and money to take vacations. 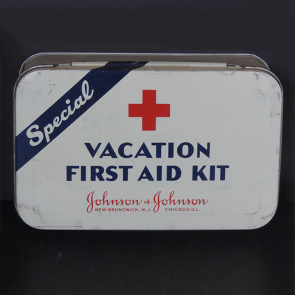 The Vacation First Aid Kit clocked in at only 5 inches wide and 4 inches long, and was an easy-to-pack item for the avid traveler, containing antiseptic cream, a roll of bandages, gauze and a set of first aid instructions. This was one of the more unique kits produced by Johnson & Johnson, and debuted at a time when visiting national parks and forests was becoming a popular pastime—annual visits to national forests topped 1 million in 1955, and that number had tripled by 1964. The kit included a scalpel and plunger, which would have been used to suction snake venom from the skin. It also included an ammonia inhalant that could help rouse an unconscious bite victim. The brightly colored, compact Marine First Aid Kit was both waterproof and buoyant, making it the ideal boat companion, Gurowitz says. The contents of the kit included medications for seasickness and heat exhaustion, as well as Johnson & Johnson's then newly developed RESUSITUBE® Airway, an S-shaped plastic tube that was meant to help revive victims of drowning. Today, Johnson & Johnson continues to help people keep medical supplies handy by offering the option to build a custom first aid kit. Whether you're headed for a camping trip or taking a long family road trip, building a personalized kit ahead of time—with supplies like waterproof bandages and pain relievers—can help keep everyone safe and healthy while having fun.